In 1927, at age 18, Patrick decided that he wanted to sell real estate in the United States. He already had family members in America: three sisters, three uncles and other relatives settled in Scranton, Pennsylvania. Go down on your knees and make me a promise here before the picture of the Sacred Heart. From now on there will be nobody but yourself to advise you and to decide for you. But your first responsibility will always be to save your soul, and so I want you to promise to be faithful to Our Lord in America. Young Patrick, center, was determined to make his fortune in the United States. Greeted by their sister Nellie, Patrick and Tom were mesmerized by “Scranton, the Electric City.” Nellie set up a meeting with Monsignor Kelly, which Patrick declined. For weeks Patrick searched, without success, for employment. Monsignor Kelly tracked him down and offered him a job as a sexton (janitor) in the cathedral – he accepted. Finally, while working in the cathedral, with the silence, peace, and joy of talking to Our Lord and Our Blessed Mother, Patrick experiences a sense of being at home and a place of happiness. Patrick’s dream of becoming a missionary priest is awakened in a new land. However, Patrick’s dream is challenged again by his lack of education so he enrolled at St. Thomas High School. His brother Tom also makes the decision to become a priest and Monsignor Kelly helps them both. 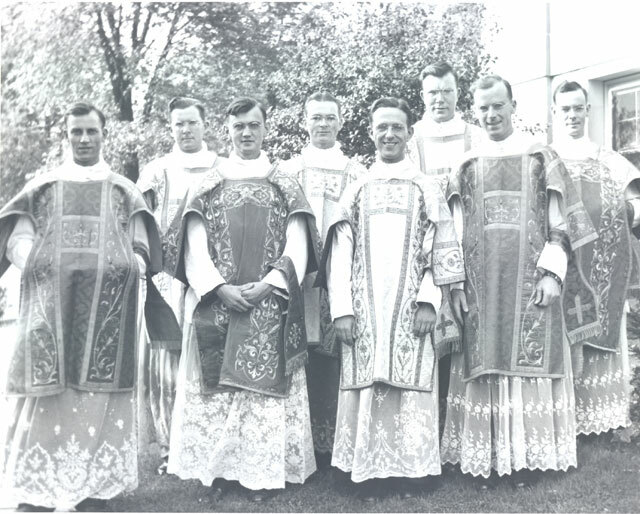 Spring of 1929 - Holy Cross priests from Notre Dame, IN visited Patrick’s new parish in Scranton, PA. Their preaching and presence spurred Patrick to realize and express a desire to become a missionary with Holy Cross. During this visit he approached Father Pat Dolan, C.S.C. (Congregation of Holy Cross), and said “I want to join Holy Cross." 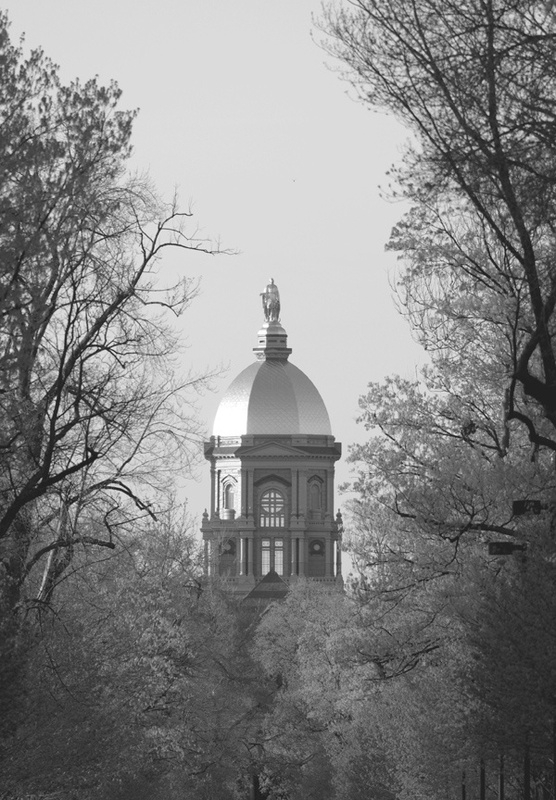 The famous Golden Dome of the campus of the University of Notre Dame. With great joy, in 1929, Patrick and Tom entered Holy Cross Minor Seminary at the University of Notre Dame in South Bend, Indiana. 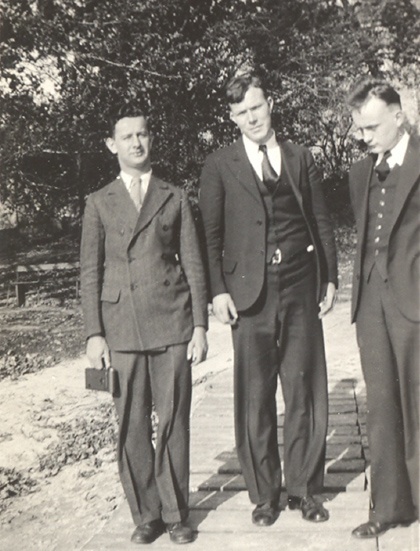 In June 1932 at the age of 23, Patrick and his brother, Tom, graduated and began the novitiate at Holy Cross. This was an intensive year of spiritual exercises that included living with and learning about the Congregation of Holy Cross. They professed their temporary vows with Holy Cross in 1933 with the Holy Cross and started studying for a Bachelor of Arts at the University of Notre Dame. After completing their bachelor degrees (Patrick with Honors) in 1937, the Peyton brothers began theological training at Holy Cross College, on the campus of the Catholic University of America in Washington, D.C. In addition to theology and canon law, Patrick also acquired knowledge that would benefit him as a missionary. Patrick lived with seminarians who were also preparing for the missions at the house called the Bengalese while Thomas lived at Holy Cross College, as he planned to serve in the United States. Patrick's oft-denied dream to be a missionary priest was now seemingly within reach. A mother's prayer and a Mother's answer! In October 1938, Patrick’s health began to deteriorate and he was diagnosed with advanced tuberculosis in November. His condition grew progressively worse. In October 1939, the doctors offer Patrick two options: a risky surgery, with little hope for success, or simply to pray. Father Cornelius Hagerty, C.S.C. visits and describes a passage from St. Paul, stating that faith is transmitted from mother to son. "You have the Faith, Pat," he said, "but you’re not using it. You brought it with you from Ireland. Your mother gave it to you, just as her mother had given it to her." 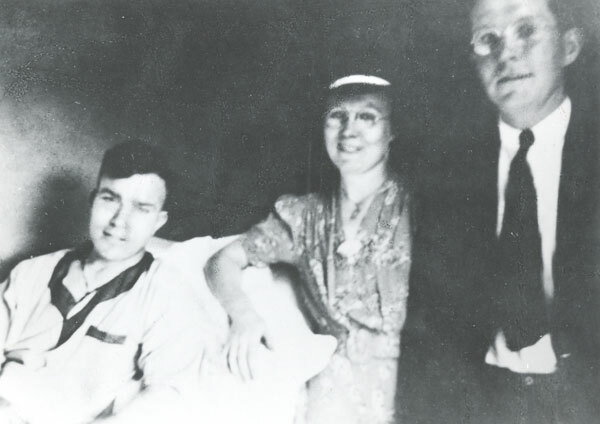 Patrick in the infirmary, with his sister Nellie and brother Tom at his bedside. Patrick did what his former mentor suggested and prayed to Mary, Our Blessed Mother for a cure. On October 31, 1939 he knew in his heart that he had been cured. His depression, darkness and feeling of loneliness were replaced by lightness, freedom and hope. Patrick saw Our Lady in a new light: how human, approachable and sensitive she is to our needs. Ordination 1941. Father Thomas is second from the left and Father Patrick is third from the right. 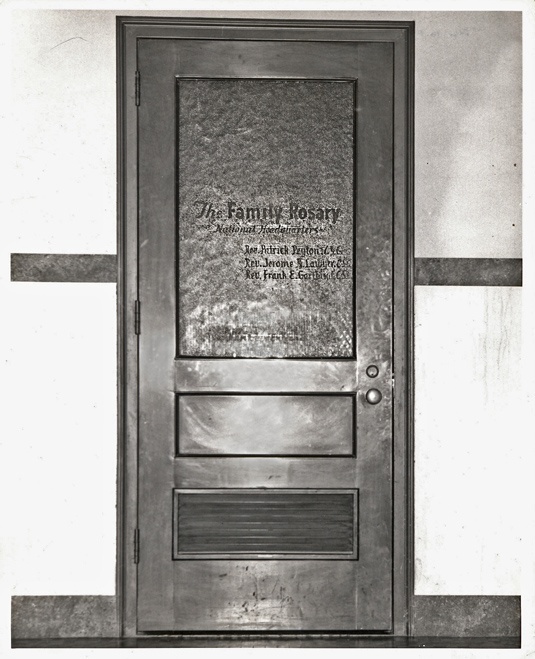 Family Rosary headquarters in Albany, NY. The office door reads: Rev. Patrick Peyton, C.S.C., Rev. Jerome R. Lawyer, C.S.C. and Rev. Frank E. Gartland, C.S.C. Father Peyton was certain that his return to health had come about for a specific purpose, namely, to foster devotion to Mary, but the question remained of how to achieve this goal. His first assignment was as a chaplain to a group of Holy Cross brothers who taught at the Vincentian Institute in Albany, New York. Father Peyton dutifully fulfilled his commitments as chaplain to the Brothers and it was in this time that a dream of establishing the Family Rosary in the homes of 10 million began to take shape. 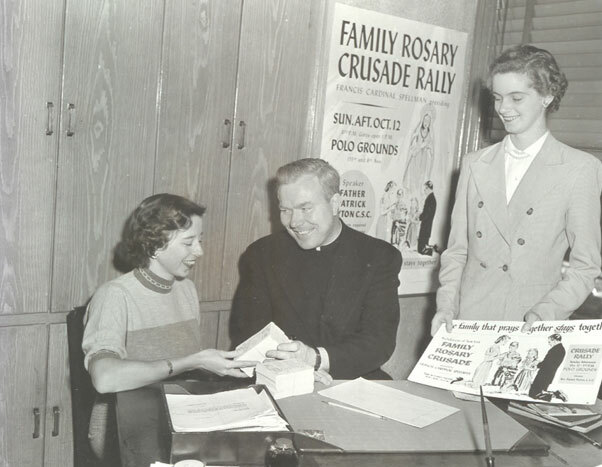 Father Pat began the Family Rosary Crusade, getting volunteer students and Brothers and Sisters from Vincentian Institute to assist him writing letters to Bishops asking their help to organize a Rosary campaign. Father Peyton enlists the aid of these young volunteers to help with the Rosary Crusade materials.